You've seen her picture here and here. I'd like to re-introdcue you to Tori our guest blogger on vintage fashion. Tori has an amazing sense of style, a huge wealth of knowledge about all things vintage, and is one of the most lovely ladies you'll ever meet. Recently my dear friend, Chelle, threw a Roaring 20’s themed birthday party - with a Great Gatsby emphasis. When we decided the theme, I knew immediately that I didn’t want to go for your typical flapper girl look – however cute that may be! After many web searches and browsing through books on vintage fashion, I compiled a list of a few key details to seek out to achieve that authentic glamorous 20’s party girl look! Color Trends for the 20’s? Pastels! Pastels! Pastels! While darker, richer colors were worn, it was all the rage to have a pastel dress paired with matching pastel stockings! Typically only the flapper showgirls wore darker stockings, so try and avoid this when going for the classy girl look. Oh, and never EVER would a classy lady wear fish net stockings! Only the more…promiscuous ladies wore those! On the stockings note, tights had not been invented at this point! So if you are going for a truly genuine look from head to toe, bring out that garter belt and those thigh highs! The more rebellious girls of those days rolled down their thigh highs to just below their dress hemline to push society’s limits…I recommend doing this. Accessories! Oh boy, this is probably my favorite part about the 20’s. The flashier, the sparklier (that’s now a word), the more gold, the more bangles, the more pearls, the BETTER! The reason for this (which is pretty cool) is that King Tut’s tomb was discovered during this era, revealing how his Queen and himself accessorized. Well, what’s cooler than accessorizing like a pharaoh and his queen? Nothing, that’s what. An example of what one might use to jazz up your outfit includes a flashy headpiece (made with beads, feathers, jewels, precious metals, or a mixture of all of the above); a long necklace made out of either gold, silver, or pearls; chandelier earrings, over the elbow gloves, and bangle bracelets or a thick gold bracelet. While searching thrift stores look for Art Deco inspired jewelry and you’ll be good to go! Shoes. T-Strap or “Character” shoes were the most popular shoe trend! They were the first shoes that wouldn’t fly off your feet while dancing. An important detail if you don’t want to give your dance partner a minor concussion while getting your Charleston on. The Dress. The most popular style of dresses in the 20’s was either drop waist dresses or shift dresses. The thinner, less shapely, more boyish figure was more desirable during this time, so any dress that gives you no shape is perfect! It was popular to play around with textures and fabrics during this time, so that gives you creative freedom in that category! I tend to lean more towards delicate fabrics, so I decided on lace for my dress. Plus, it felt a little more glamorous! There you have it! Five key details to pay attention to while searching for that perfect Roaring 20’s look. If you have enough time in advance, I recommend scouting out Estate Sales. Those can be complete gems for that authentic vintage flair! Thanks for letting me share with you! Thanks Tori! Now you can create an authentic Gatsby look. 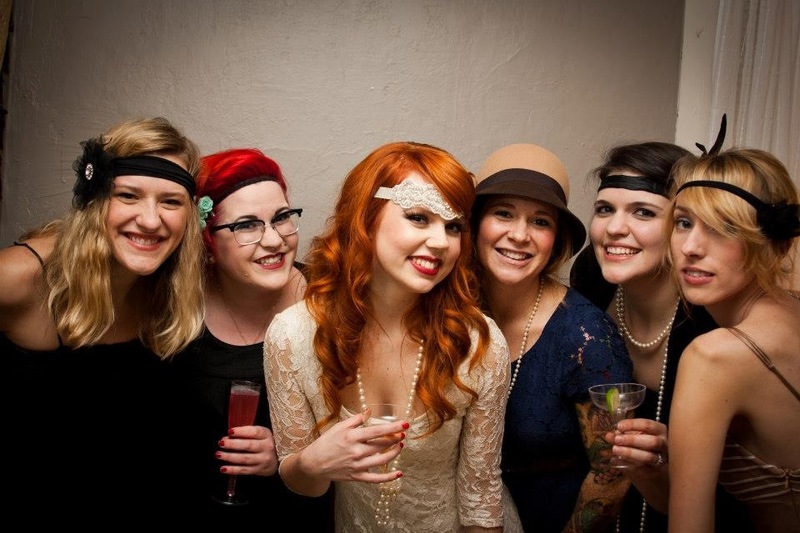 More party Gatsby ideas in the here!